Would you go on a big trip without researching your destination? Without planning your route? We believe the best brands are made when strategy is applied. Design decisions become easier, and implementation + marketing are in line with a broader goal that everyone works toward. Strategy encompasses discovery, research, surveys, competitive analysis, target market research, brand development planning, brand foundations + determining an aesthetical point of view. What does our process look like? Well, we’re going to share it all using one of our works in progress — VOKTAIL. Let’s go! Every project starts of with a lengthy questionnaire. No one knows the business or vision like those directly involved. We do this step to understand where they’re coming from + what they’ve done so far so we can align on where we go together. What is the history of your organization? How did it start? What has happened since? What is the big picture goal of the organization? What are your non-negotiable standards + values as an organization? What do you NOT want to be known for? Describe your ideal/future supporters in detail. What types of people are they? What do they value? Etc. What problem does your organization solve for people/ your supporters? Are there any icons or special imagery that could resonate with your brand? Are there any words, icons or images you want to avoid? What is the feeling you want potentials customers/supporters to come away with when they start to learn about you? For Voktail, the discovery process showed us that this brand concept, while loosely formed, has a strong sense of values, high standards + a lot of opportunity. We knew we could pair their values + our research to form a solid brand foundation they could grow with. From the discovery session, we understand the baseline of what we have to work with, so it’s now off to the races to build the brand strategy. We start with research to help us understand the landscape of the project’s industry, what’s currently happening + what extra opportunities we may be able to leverage in bringing the brand to life. For Votkail, we found in our research that the vodka market is in a slow decline + it is oversaturated. The cocktail creator market is also heavily saturated, and it’s hard to stand out. Our research also indicated that the most successful brands are ditching the flavors, moving back to their roots + creating pure products. Consumers of gin + vodka projects want a product that also carries a retro vibe with a modern twist. This research helps frame the rest of our process by guiding the recommendations we presented for brand development growth. Everyone in a project like this has their own bias, their own perceptions of growth + a specific idea of what it could be. Those are gut reactions, and they are incredibly powerful. We also like to reach out to our networks to get an opinion that is outside the brand to get a true, unbiased perspective. We ask questions about things we’re curious about, and the responses help us define how we move toward recommendations. Do you ever drink vodka in cocktails + mixed drinks? What are your favorite vodka brands? What is most important to you when selecting vodka to enjoy? What is least important to you when selecting vodka to enjoy? What are your favorite vodka cocktails + mixed drinks? Are you interested in trying new drink recipes, or do you prefer to stick to the classics? Are the quality of ingredients in your cocktail/mixed drink important to you? Responses were in line with our outside market research and showed that Millenials + older Gen Z working professionals are largely interested in craft cocktails. They value mid- to top-shelf spirits, quality cocktails + product branding, and they are willing to pay more for a drink if the spirit + mixer are both top notch in taste + drink presentation. Surveys + focus groups help gauge the potential success of a product or service, and they help to determine the target market + what they are after. Just because we’re not talking specifically to all the people we COULD talk to does not mean we are not aware of or do not value those people. Our focus is on who we SHOULD talk to — those who are using us as a guide. Content will cross over naturally. If we’re talking to a specific group, others can still see themselves in what we do. For Votkail, we defined their target market as the working professionals of the Millennial + Gen Z generation. They are paying off debts but still have some income to enjoy going out for a drink after work with colleagues or meeting up with friends over weekend. They are over the hyper-flavored drinks full of faux sugar + colors and want their drinks to be rooted in more traditional practices while playing with forward-thinking, innovative practices. This group is redefining the rules + what quality means in the alcohol — and particularly spirits — arena. They are overall drinking less, like the rest of Americans, but they are are spending more on drinks when they do drink, and they expect their drinks to be the full package. They want quality they can taste + see, a compelling story behind the product and damn fine branding + packaging. This group also wants drinks that are more “pure”. Knowing this is Voktail’s target market, we will be sure their brand offers something of quality that is unique in taste + presentation. Voktail is a special case because they are working with an idea — one that has a lot of opportunity. Still, the lack of a physical product or service means we get to brainstorm + find opportunities we can write into the brand strategy that can help facilitate decisions to get them to where they want to be long term. Now that we know what we’re dealing with, who we’re talking to, what they want + where we want this brand to go, it’s time to build the brand through foundational pieces that set the stage for everything moving forward. To be transparent + share ingredients, preferred vendors/sources + why we chose them to highlight our quality + values. A lifestyle drink(s) of fun + freedom while remaining grounded. Something that makes people feel like they are cutting loose + indulging in without the guilt. To create an experience for people when they drink one our extraordinary creations. Voktail’s tone + style of speaking is fun + slightly rebellious tone while keeping our class. We keep our tone, references + humor in line with our vibe. Then, we move into brand words. We are a big fan of using words in branding because they are emotionally packed + guid the brand tone of voice and overall perception of how we communicate collectively. They are dynamic words that help articulate powerful concepts that our brand is founded on. We believe vodka + Voktails shouldn’t fall short on quality or taste. We only source high-quality ingredients, whether it’s the vodka we’re pouring or the custom craft mix we are combining it with. We think you should drink quality & your experience shouldn’t fall short in any area. The Voktail experience is one of class, style & sophistication. 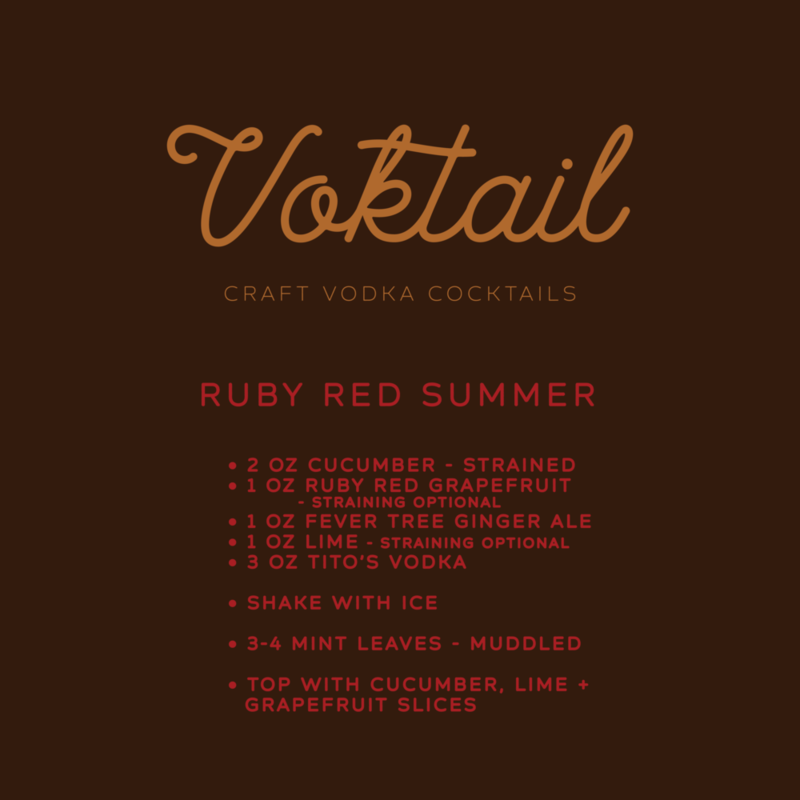 From presentation to taste, Voktails make the right first impression. Our classiness is not predictable or stuffy. While we appreciate the classics & are put together, our class is fresh & forward thinking. We don’t exclude, we invite all into the experience. Shaken or stirred, Voktails let you indulge without the guilt. Indulgence is the rebel streak in our classy nature - we work hard &, we know what we want and we want to cut loose & have fun. Our indulgent side doesn’t break the rules, but it does bend them a little. Now that the brand strategy is completely in line with all of our expectations + we are all thrilled to make this happen, now comes the aesthetics. Just like our brand strategy + discovery, we start with an alignment step that helps us understand everyone’s visual preferences when it comes to the brand. How do we do that? MOOD BOARDS. Mood boards help us articulate design ideas in graphic ways. It’s a lot easier to get the vibe right with the right inspiration. We also throw in color blocks to start the conversation around the colors their new brand will embody. Our mood boards also carry emotions with them through the images + colors we choose. We pick a variety of applications to illustrate how we could extend the brand, from physical product, to collateral, to logo style + set up. For Voktail, we understood from our discovery that they wanted to have a nostalgic, retro vibe. Luckily for us, that was seen in the research as desirable to our target audience. We crafted three versions + some mockups to support them to help us decide which angle this brand should go from a visual perspective. Incredible bonus points to this project were that 1. Donald Draper is inspiration and 2. retro/mid-century design is one of our favorites to be inspired by. Option 1 - This options was used to showcase a more hand-drawn, craft vibe that would lend itself to a more rustic quality while still nodding retro. We threw in warm tones to bring a sense of connection while skewing on the more masculine side. Using the above moodboard, a place to start when developing the wordmark logo for Voktail would look begin with a monoline script vibe. Collateral example using this style. Option 2 - Using inspiration heavily from House Industries, this mood board was based off a more quirky take of mid-century design. Decade specific script, color block graphics, illustrations of drinks + of course DD helped this mood board evoke a calming but interesting point of view. The teal + orange are wonderful colors to play with, since we can envision a lot of vodka recipes including those colors. Using the second moodboard, a place to start when developing the wordmark logo for Voktail would include fonts with a more bold take. Option 3 - No good retro vibe is done without exploring some red tones. This mood board was shown to evoke an old Hollywood vibe while bringing in scripts + graphics that brought it more modern. Using images with fresh fruits + drinks we also see how this could come to life when photo shoots are being planned. Using the third moodboard, a place to start when developing the wordmark logo for Voktail would include work around a script font with a customized retro feel. The beauty of doing this mood board step allows us to brainstorm in visual terms. Explaining color is hard to do with words, but having images that speak those words for us helps us save time, rounds + creates an end result that is exciting, not surprising. We also allow tweaks to mood boards at this point before we go on to actual brand identity work. We might want to pull a few things from one option + bring it to another. This work is truly collaborative + our goal is that at each milestone there is excitement for the next phase. Where do we go from here? 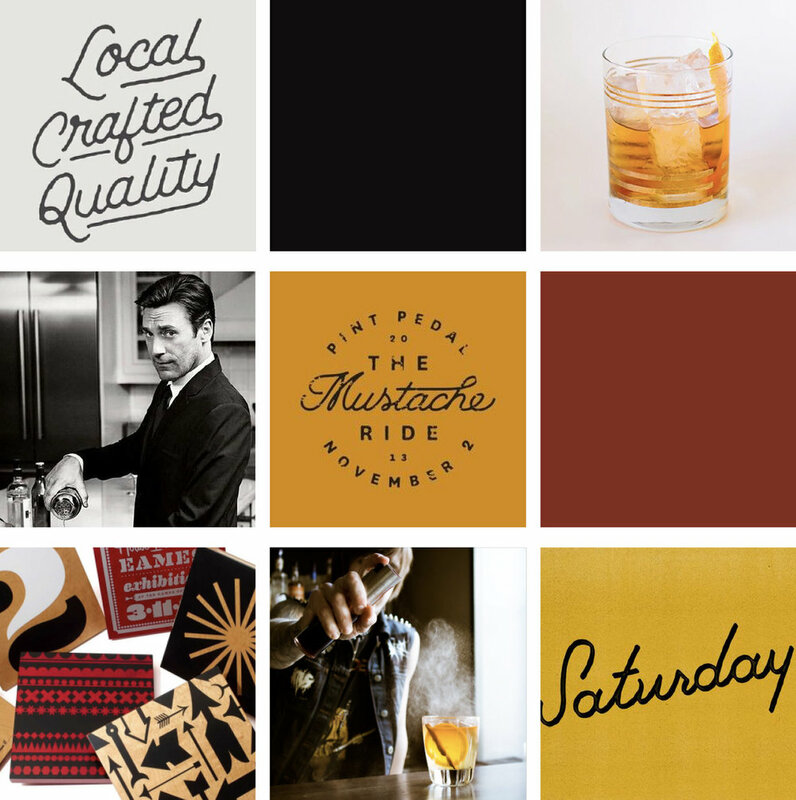 We pick a mood board + begin designing the brand identity based off of that direction. Which mood board would you choose? Which one do you think they are moving forward with? Many steps are still to be taken to bring this brand to life. Stay tuned for the follow up of our in-depth process overview featuring Voktail. Grab a drink while you’re at it, too.